Achillea dracunculus Hort. ex Steud. Artemisia inodora Hook. & Arn. Tarragon (Artemisia dracunculus), also known as estragon, is a species of perennial herb in the sunflower family. It is widespread in the wild across much of Eurasia and North America, and is cultivated for culinary and medicinal purposes. One sub-species, Artemisia dracunculus var. sativa, is cultivated for use of the leaves as an aromatic culinary herb. In some other sub-species, the characteristic aroma is largely absent. The species is polymorphic. Informal names for distinguishing the variations include "French tarragon" (best for culinary use), "Russian tarragon" (typically better than wild tarragon but not as good as so-called French tarragon for culinary use), and "wild tarragon" (covers various states). Tarragon grows to 120–150 cm (47–59 in) tall, with slender branched stems. The leaves are lanceolate, 2–8 cm (0.79–3.15 in) long and 2–10 mm broad, glossy green, with an entire margin. The flowers are produced in small capitulae 2–4 mm diameter, each capitulum containing up to 40 yellow or greenish-yellow florets. French tarragon, however, seldom produces any flowers (or seeds). Some tarragon plants produce seeds that are generally only sterile. Others produce viable seeds. Tarragon has rhizomatous roots that it uses to spread and readily reproduce. French tarragon is the variety used for cooking in the kitchen and is not grown from seed, as the flowers are sterile; instead it is propagated by root division. Tarragon is one of the four fines herbes of French cooking, and is particularly suitable for chicken, fish and egg dishes. Tarragon is the main flavoring component of Béarnaise sauce. Fresh, lightly bruised sprigs of tarragon are steeped in vinegar to produce tarragon vinegar. In Iran, tarragon is used as a side dish in sabzi khordan (fresh herbs), or in stews and in Persian style pickles, particularly 'khiar shoor'. A. dracunculus oil contained predominantly phenylpropanoids such as methyl chavicol (16.2%) and methyl eugenol (35.8%). Gas chromatography/mass spectrometry analysis of the essential oil revealed the presence of trans-anethole (21.1%), α-trans-ocimene (20.6%), limonene (12.4%), α-pinene (5.1%), allo-ocimene (4.8%), methyl eugenol (2.2%), β-pinene (0.8%), α-terpinolene (0.5%), bornyl acetate (0.5%) and bicyclogermacrene (0.5%) as the main components. ↑ Artemisia dracunculus was described in Linnaeus's Species Plantarum 2:849. 1753. "Taxon: Artemisia dracunculus L.". GRIN Taxonomy for Plants. GRIN. 2014-08-17. 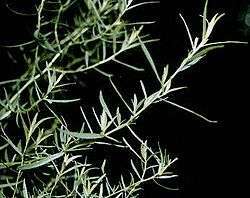 ↑ The Plant List Artemisia dracunculus L.
↑ Flora of North America Vol. 19, 20 and 21 Page 508 Wild tarragon, Artemisia dracunculus Linnaeus, Sp. Pl. 2: 849. 1753. ↑ Flora of China Vol. 20-21 Page 722 龙蒿 long hao Artemisia dracunculus Linnaeus, Sp. Pl. 2: 849. 1753. ↑ Altervista Flora Italiana, Assenzio dragoncello, Artemisia dracunculus L.
↑ "Artemisia dracunculus". Missouri Botanical Garden. 1 2 McGee, R. M.; Stuckey, M. (2002). The Bountiful Container. Workman Publishing. ISBN 978-0-7611-1623-3. ↑ Committee on Herbal Medicinal Products (2015-03-31). "Public statement on the use of herbal medicinal products containing estragole" (PDF). European Medicines Agency (Rev 1): 3. Retrieved 25 November 2016. ↑ Zeller, A.; Rychlik, M. (2007). "Impact of estragole and other odorants on the flavour of anise and tarragon". Flavour and Fragrance Journal. 22 (2): 105–113. doi:10.1002/ffj.1765. ↑ Lopes-Lutz, D. S.; Alviano, D. S.; Alviano, C. S.; Kolodziejczyk, P. P. (2008). "Screening of chemical composition, antimicrobial and antioxidant activities of Artemisia essential oils". Phytochemistry. 69 (8): 1732–1738. doi:10.1016/j.phytochem.2008.02.014. PMID 18417176. ↑ Sayyah, M.; Nadjafnia, L.; Kamalinejad, M. (2004). "Anticonvulsant activity and chemical composition of Artemisia dracunculus L. Essential oil". Journal of Ethnopharmacology. 94 (2–3): 283–287. doi:10.1016/j.jep.2004.05.021. PMID 15325732. Look up tarragon in Wiktionary, the free dictionary.